SUPER SIZE ECLIPSE-- Waking up Saturday morning before sunrise can be tough to do, especially on a weekend. But you might be glad you did because a total eclipse of the Moon will be visible in the early morning skies off the coast of San Diego. According to NASA.gov, the eclipse action begins around 4:45 am PST when the red shadow of Earth first falls across the lunar disk. By 6:05 am, the Moon will be fully engulfed in red light. For early risers in the western United States the eclipse is deepest just before local dawn. Face west to see the red Moon sinking into the horizon as the sun rises behind your back. It’s a rare way to begin the day. And it will be the last total eclipse until 2014. 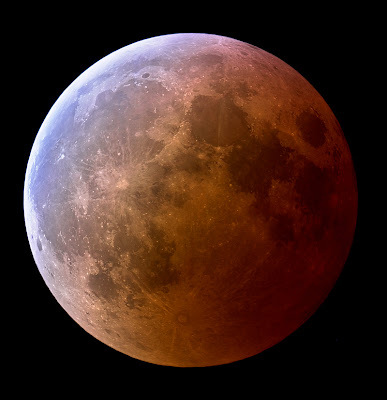 Not only will the Moon be beautifully red, it will also be super-sized by the Moon illusion. For reasons not fully understood by astronomers or psychologists, low-hanging Moons look unnaturally large when they beam through trees, buildings and other foreground objects. In fact, a low Moon is no wider than any other Moon (cameras prove it) but the human brain insists otherwise. To observers in the western USA, therefore, the eclipse will appear super-sized. Also, it might seem puzzling that the Moon turns red when it enters the shadow of the Earth—aren’t shadows supposed to be dark? In this case, the delicate layer of dusty air surrounding our planet reddens and redirects the light of the sun, filling the dark behind Earth with a sunset-red glow. The exact hue (anything from bright orange to blood red is possible) depends on the unpredictable state of the atmosphere at the time of the eclipse. As Jack Horkheimer (1938-2010) of the Miami Space Transit Planetarium loved to say, "Only the shadow knows." Image: courtesy of NASA.gov. Photo of March 2007 total lunar eclipse was snapped by Jens Hackman of Weikersheim, Germany.